The cries of the people over Iran’s economic crisis are becoming too loud to ignore. The whole country is engulfed in the flames of civil unrest and public anger. 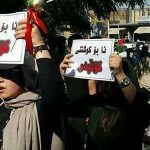 Strikes have raged for the past eleven days in Baneh and Javanrood; shops remain closed as business owners refuse to yield to the regime’s demands. In Isfahan, the local farmers have continued to vent their frustrations at the country’s deepening water crisis and the regime’s mismanagement of the situation. The sit-in at the local government buildings entered its sixty-ninth day. The local governor met with the protestors, but provided no solutions, leaving the farmers with no choice but to continue their struggle. Farmers in Ardestan protested the drilling of water wells this week. Given the scarcity of water, continued drilling would only cause further shortages in the future. In Khuzestan Province, farmers from Weiss and Mollasani took up their shovels to protest their own water crisis. 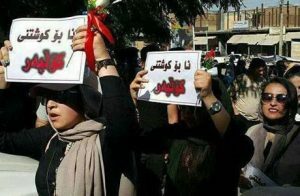 In Hamidieh, protests against the regime entered its third day. Protestors have not received their salaries for months and, despite repeated empty promises from the regime, there are no indications payments will be distributed any time soon. A similar situation is developing in Yazd. Truck drivers who drive fuel-supplying trucks in the region went on strike over lower wages. Citizens from Tehran and Ahvaz protested outside the cities’ financial institutions over the regimes ransacking of the country’s banks, leaving the public out of pocket, without access to their savings. The level of public outrage indicates the extreme economic situation in Iran. The Iranian currency has plummeted in value, leaving salaries lower than ever. The regime has squandered more than 400 trillion tomans of public money and hollowed out the country’s financial institutions. The banks are on the brink of collapse, with some banks having spent as much as 80% of their deposits. Discrimination is rife. The government forces receive four times more pay than contracted forces. Just under half of the country’s workforce are employed on temporary contracts with little job security and low job satisfaction. The country’s Central Bank is woefully ill-equipped to handle the economic crisis and impending economic collapse. Rather than employ competent, elite economists, the regime has filled the institution with its cronies, inexperienced in generating economic policy and running an economy. The regime has mismanaged the national finances and destroyed the Iranian economy for decades. The people have reached their breaking point, and the recent spate of protests are just the beginning. MP from Hamedan, Amir Khojasteh, addressed the Minister of Economy, Massoud Karbasiyan, directly. He said, “if you do not sort these [economic issues] out, swear to God, the people will make their decision on us”. He is not wrong. The people will make their decision. The continued economic ruin of Iran cannot continue. The public will not let it. Inspired by the success of recent protests, they will drive the Iranian regime out of power and replace it with a democratic government with the knowledge and inclination to save the Iranian economy.